Destination weekend weddings are in! Couples tying the knot are wanting to treat their guests to a memorable experience... if guests are going to take vacation days, and commit a full weekend to wedding activities, might as well make it a full affair! Enter glamping. We've been advocate hosting all parts of the event (including accommodation) on site, treating your guests to a plush tented hotel experience, so that the party never has to end! Why not keep your dear ones close for the entire celebration? Brit, of Daughters of Simone, and Jeff embodied this concept fully. Their wedding took on the flavor of a private music festival with live music from Brothers NYC in a forested area around Yosemite, California. An entire village was built for the weekend in the middle of beautiful nowhere! (See previous post for list of vendors). This festival wedding has grabbed the attention of the Huffington Post, and two features on Green Wedding Shoes. Here's Part 1, and Brit quotes in Part 2, Since we both love camping, not just at festivals but in general, we wanted to incorporate this aspect most of all. We thought it would just be the coolest thing to be under the stars with all of our favorite people the night before our wedding. Here is the story of how this adventurous couple came to be, with a wedding design most appropriate! Videographer: Asher Moss captures this Yosemite wedding (one of the most spectacular outdoor venues we've been a part of thus far!) Thanks for having us at your rad wedding Brit and Jeff! We even spotted our foreman, Neil, showing off some good ol' western swing on the dance floor! Large Teepee Tents & TeePee Bathrooms: Our TipiMarqui™ and TipiBath™! Every day is an event day... if you combine your favorite people, a gorgeous landscape, and some special details to bring yourself out of the ordinary. Five wonderful women visited our glamping resort, Moab Under Canvas, and transformed our luxury tent into their very own. Visit cosmomuse.com for the full post and more photos! Themes of Western, Modern meets Classic, Greenery with a Glamorous take on garlands and wreaths... all under the majestic watch of the Teton Range. Canvas Unlimited, Persephone Bakery, Hunter Gatherer, and Fleur De V all feature their talents in this beautiful wedding. Head directly to the article on Erin and Chad's Wedding or view the entire issue below. We had so much fun making a glamping set up on the set of The Boris & Nicole Show! Big thanks to Durkin Entertainment for production. Fast forward right to 39:43 for the segment on our lovely co-founder and CEO, Sarah and our glam tents! We don't even have words to describe this Jackson Hole wedding from Simply Grand Weddings and Events. Ornate western?... Common concepts like rustic chic sound cliche when referring to the elegant details that grace this event at Moose Creek Ranch. Only the photos from Shane Macomber do it justice. Big thanks to: Flowers by Fleur de V Events, furniture in tent by Canvas Unlimited, lounge furniture by Hunter Gatherer, cake by Persephone Bakery. The photos below feature three of our TipiMarqui™ conjoined together into one large dancing and dining space for the reception, as well as a few fun moments with the TipiBath™. Kid in a candy store?... and you mean I just get to play and look at everything?! It's a window shopper's dreamland. Paul Douda and The Wedding Party so beautifully captured the festive atmosphere of The San Diego Wedding Party Bridal Show on the grounds of the Hyatt Mission Bay. This was a new one for us -and oh what fun! Our TipiMarqui™ served as backstage for a wedding fashion runway show! Our Under Canvas Events California branch joined other Cali wedding vendors on the grounds of the Hyatt Mission Bay for a San Diego Wedding Party show. Lauren Sharon Vintage Rental & Design provided the lovely vintage styling! 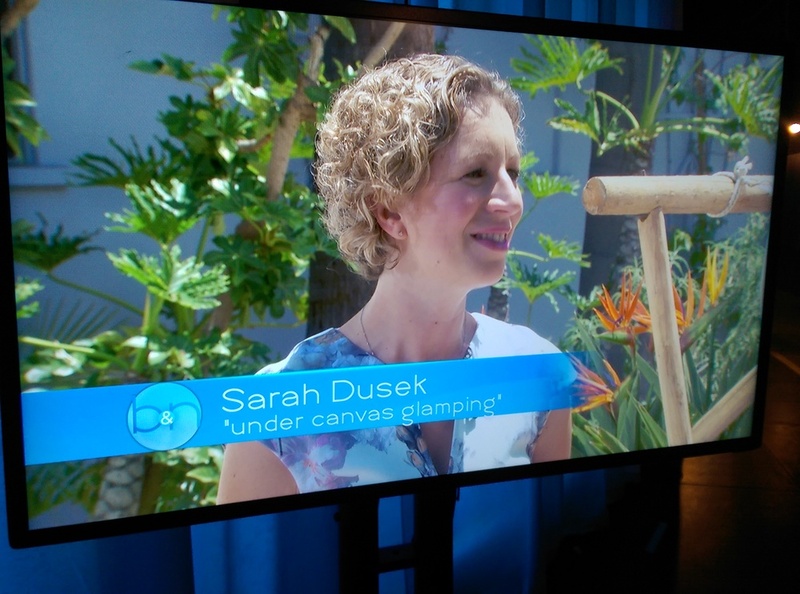 We were thrilled to partner with Durkin Entertainment on the EcoLuxe Lounge at the 2015 Academy Awards! Under Canvas provided a Teepee and Safari tent for a rooftop lounge and bar space atop the Beverly Hilton for an Oscar Nominee party! Oscar Nominees from films including American Sniper, The Theory of Everything, Guardians of the Galaxy, The Hobbit and Whiplash stopped by. For more event details and a full list of notable attendees and nominees view the event press release. We just returned from this lovely Wedding Show at the Miner's Foundry Cultural Center in Nevada City, CA. What a perfect venue for our luxury tents! The Miner's Foundry with its high ceilings, large timber trusses, and stone walls -all in a neutral gray wash, is a great complement to what we call our original Under Canvas luxury: our "rustic meets elegance" signature style. Roots Reclaimed Vintage Rentals did a fantastic job playing with our combined neutral palette. 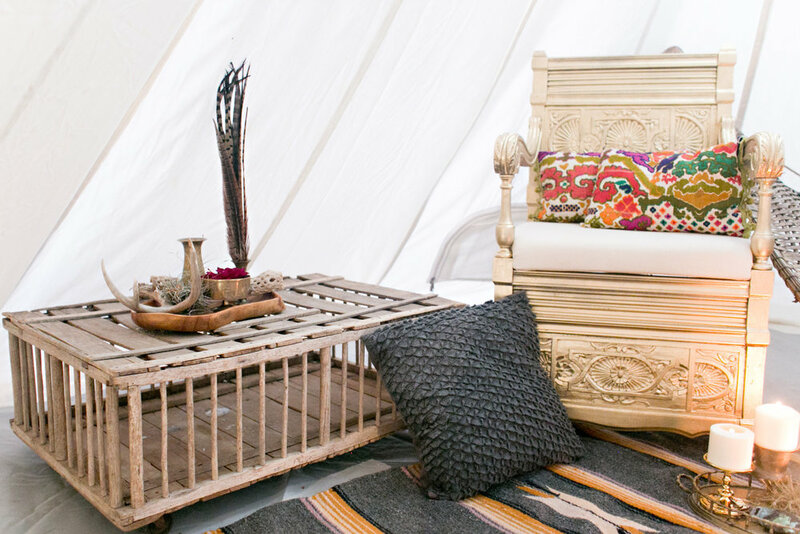 They bedecked our 14' Tipi with an array of bohemian details, turning it into a very cozy lounge space. A Safari tent was furnished with a full dining table and chairs and ornamental chandelier...What a creative use of the Safari tent space! Backyard dinner party anyone? We loved connecting with other vendors in Nevada City, such as the Outside Inn (check out the write-up they did on One Fine Day). It's a been a wonderful first few months for our new California team and tent base in San Luis Obispo. We are looking forward to working again with our new friends in Nevada City and all over Cali! Who better to display the details of this colorful desert wedding at Moab Under Canvas than the photographer himself? Please visit James Moes' gallery to see his favorite shots from the weekend's glamping affair.